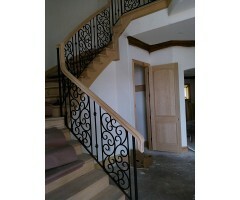 Triple rolled dark pewter scroll panels make a beautiful combination with the wood handrails. .. 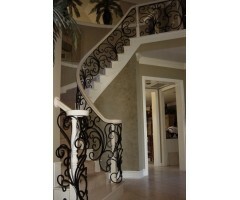 This curbed stair rail displays a large scroll, a double collar, single twist, double collar, then repeat this pattern framed with a bottom rail and top forged steel molded rail. ..
With the graduated placement of square collared bars between a top and bottom rail, the top border makes a beautiful show of display with the medallion centered between two c-scrolls and capped with a high quality molded steel handrail. .. This staircase is an example of elegance with the large classic black elegant scrolls framed with a bottom and top rail, then topped with a wood hand rail to balance the wood trimwork on the curb below. .. The high impact visual treat of the rolled barrel volutes combined with the classic black scrolls set and mounted directly to each of the stair treads creates an exquisite design feature. 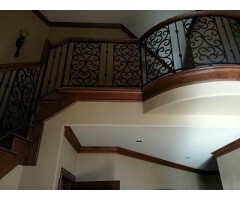 The wood handrail was painted to coordinate with the trim work and really pulled the beauty of the ironwork out. .. This stair rail is the same pattern as ST-042 with a totally different look based on what color choices are made and what design look you are going for. .. The homeowner of this home chose a decorative baluster for one out of every 4 with single and double twists between and mounted directly to the stair tread. 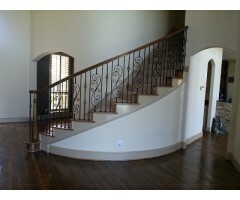 This lends to a very tasteful combination with a wood handrail. .. Using a hammered bar for top and bottom frame on the large scrolls, including long stretched scrolls fit within the top border and a forged steel handrail to finish this beautiful style statement. .. The scroll panels combined with a double collar bar and framed completely prior to installing a wood hand rail created an elegant look for this home. .. The curved balcony rail on this photo is a continuance of ST-046 stair rail - the natural wood molding along the stair and balcony compliments the ironwork beautifully with the matching wood handrail above. .. This curved stair rail is like a beautiful neclace with it's pewter tone accented by gold tipped leaves, and the elegant barrel volutes set with pride on the curve of the starter step. .. 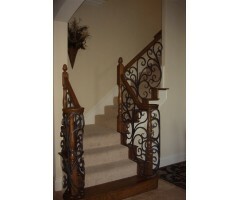 Alternating scroll, double basket, and single twists set directly on the treads with a shoe base, wood handrail and newels. ..